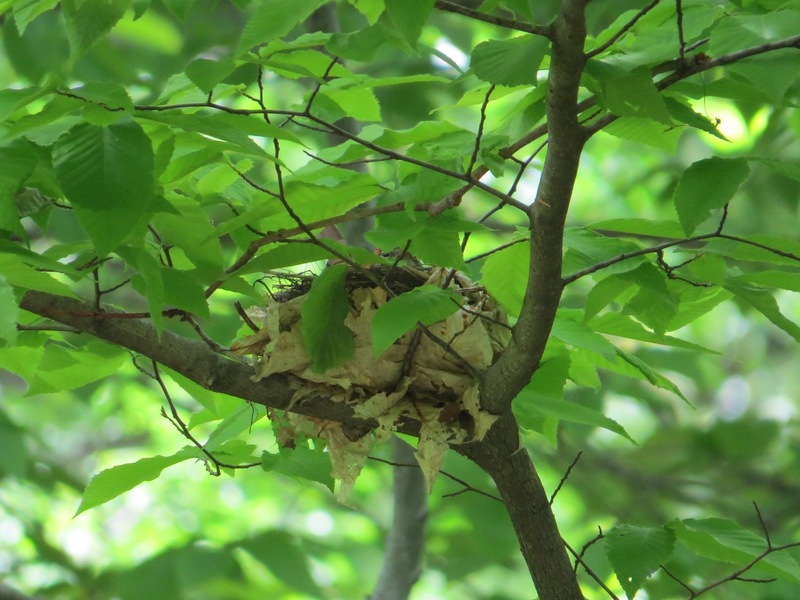 If the rich fluty yodeling of a Wood Thrush (Hylocichla mustelina) hadn’t alerted me, I probably wouldn’t have noticed their nest. 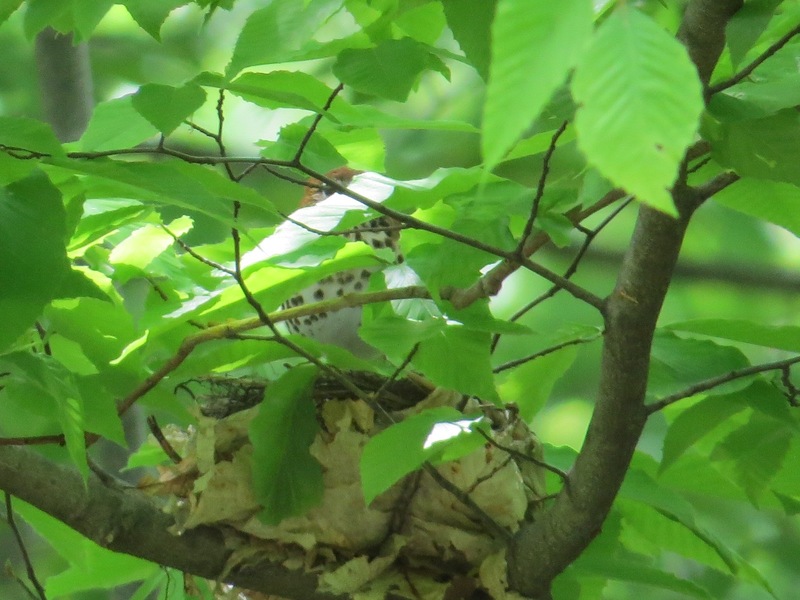 You can just see the top of the bird’s head here, rusty orange, with white eye-ring. And the heavy spotting on the breast. Tis the season. Clutch size for this species is 3-4. The eggs are blue/bluish, slightly paler than the classic Robin’s egg blue. Incubation is done by the female and lasts 13 days. The species is declining across its range; one factor may be acid rain, which leaches calcium from the soil, resulting in decreases of calcium-rich invertebrate prey needed during breeding. 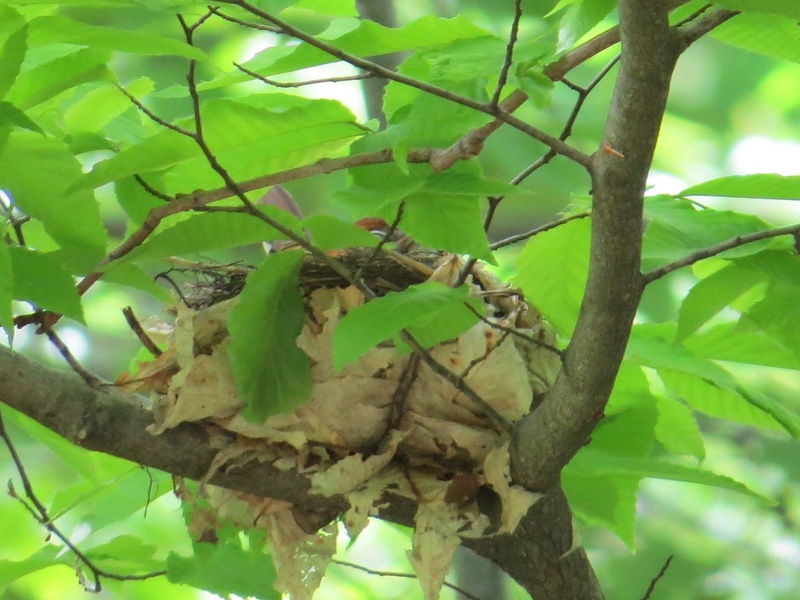 As a side note, this was in the Thain Family Forest in the NYBG, which boasts that it’s the last old growth patch in NYC: the yellow signs of a recent pesticide application were still up. I was recently reading some of Stephen Jay Gould’s essays — from his famous monthly run in Natural History, which have thankfully all been collected — and thought, wow, here is a voice sadly missed. What else I’ve read of him so far, The Mismeasure of Man and Wonderful Life: The Burgess Shale ad the Nature of History, are richly rewarding; and now I intend to go deeper. This appreciation by Matthew Lau concurs. 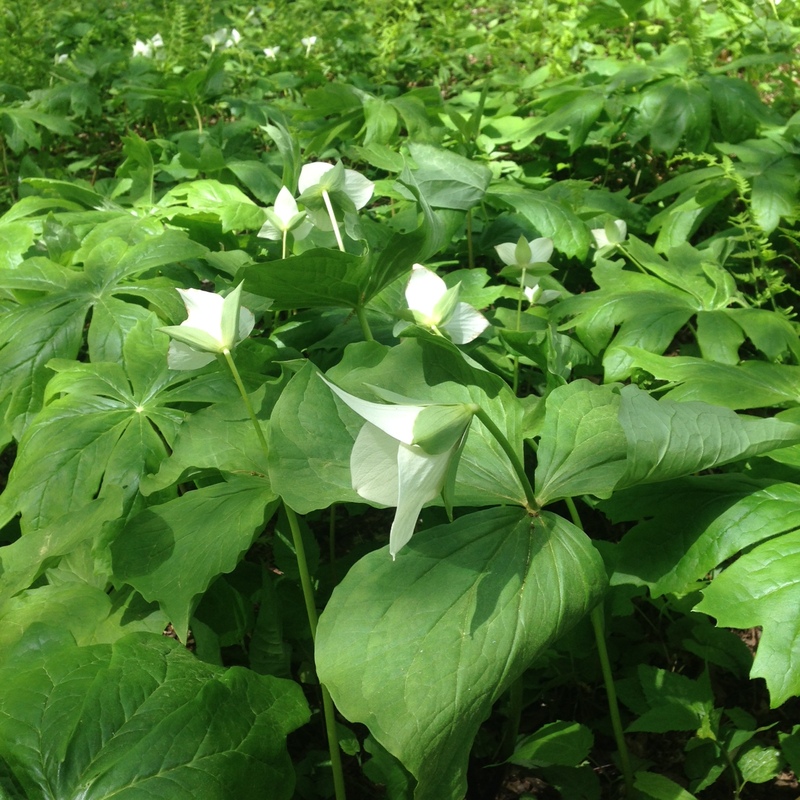 These were some of the native trilliums in the New York Botanic Garden earlier this month. The seeds of these plants are distributed by ants, who are attracted to the lipid- and protein-packed elaiosomes (“oily body”) on the seeds. 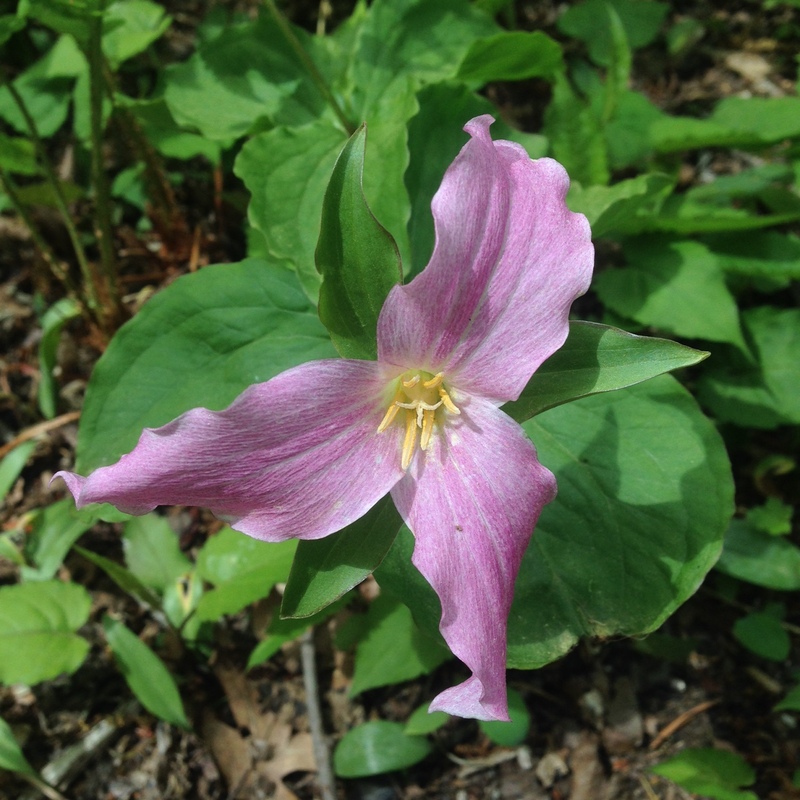 Like all wildflowers, these beauties are best left alone. Picking the flower can kill the whole plant. 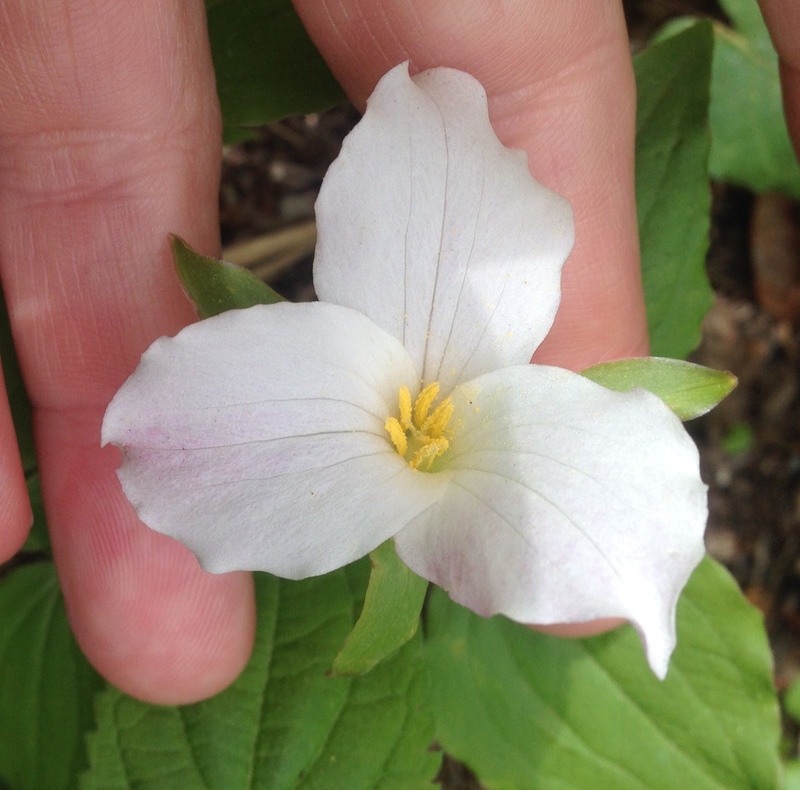 In some states, taking trilliums (in general, or particularly rare and endangered species, depending on the state) is illegal. It’s a pity that such laws have to be made. It’s freaking 2017, already! Sigh, so it is. Here’s how the loose cannon in the White House is smashing the ship of democracy to smithereens. And here he is compromising intel sources by boasting of it to… the Russians. How many deaths will Trump’s willful ignorance and arrogant incompetence lead to? Was there some grumbling about Tuesday’s bird-parts photos? 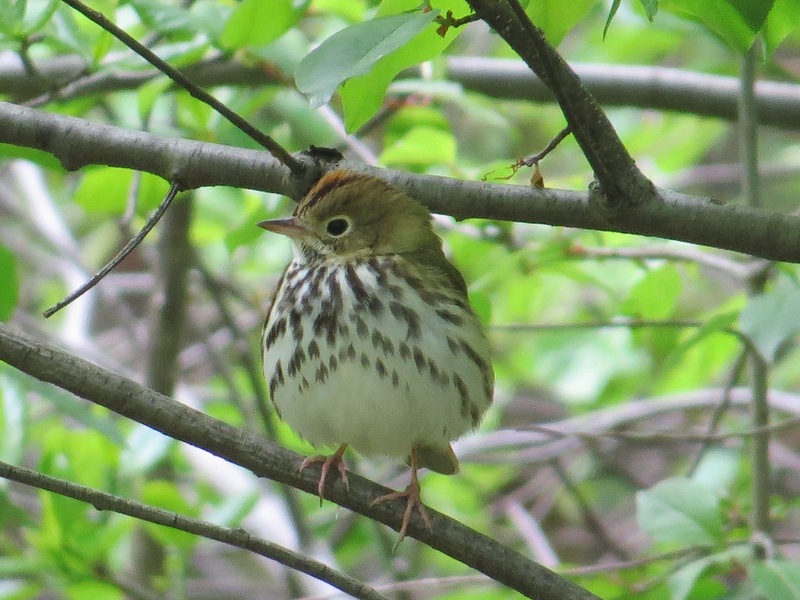 Here’s an Ovenbird (Seiurus aurocapilla) to tide you over until you get outside. 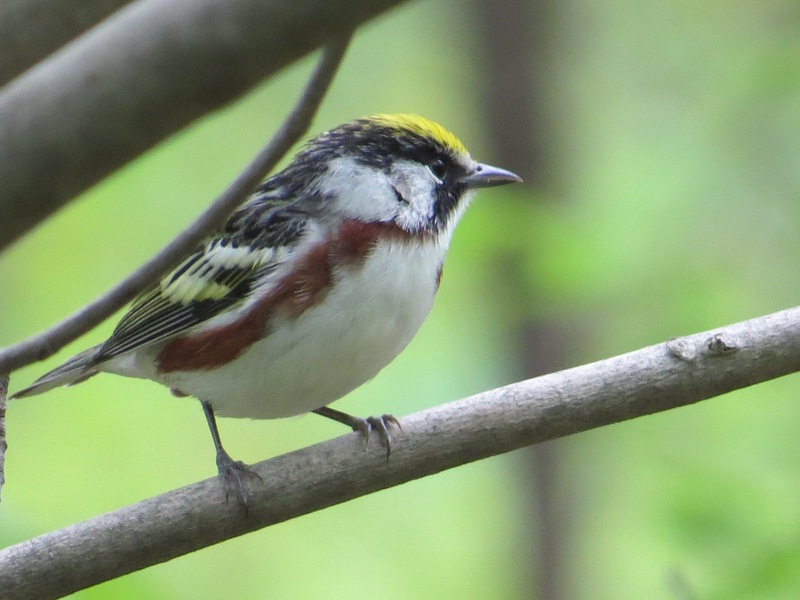 And a Chestnut-sided Warbler (Setophaga pensylvanica). 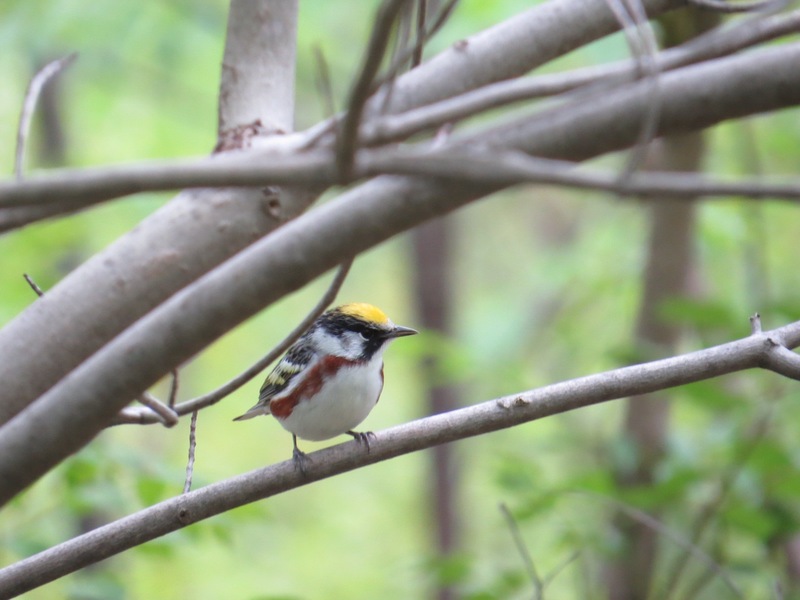 One of my favorite warblers. 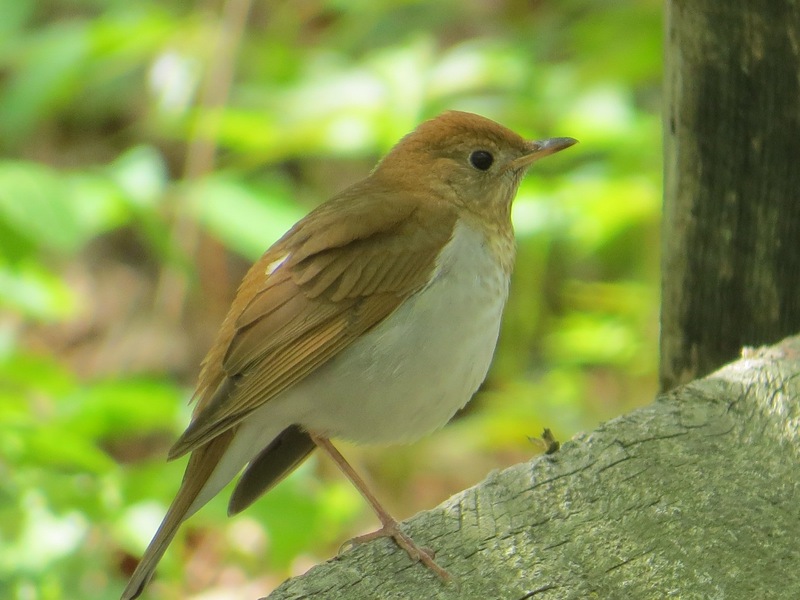 A Veery (Catharus fuscescen), our least marked thrush. 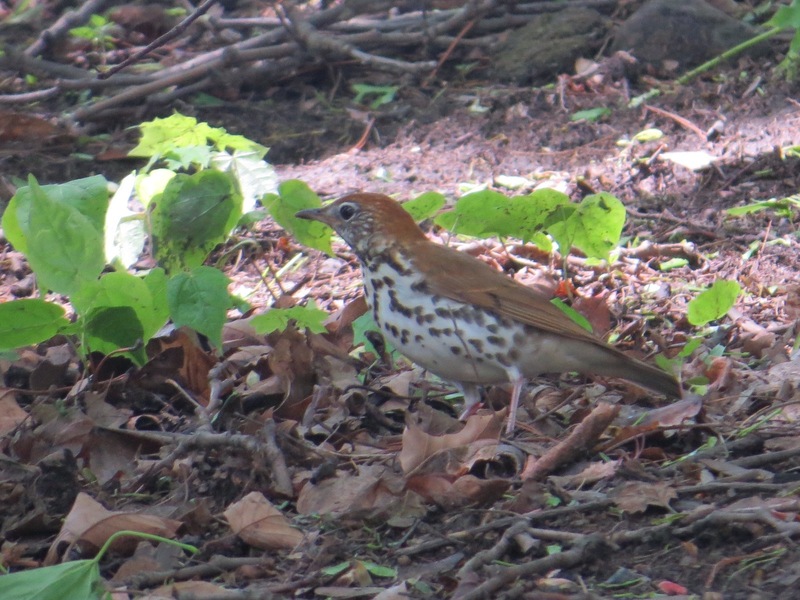 Wood Thrush (Hylocichla mustelina), our most-marked thrush. 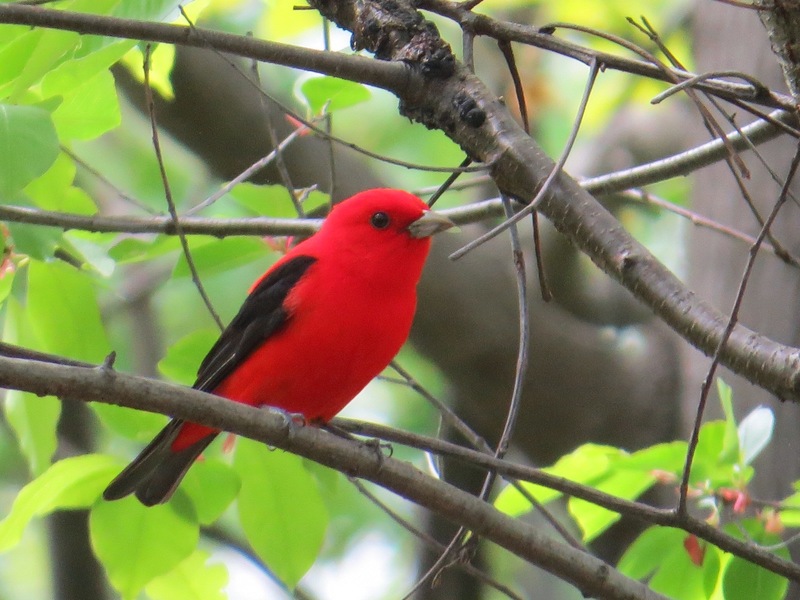 Scarlet Tanager (Piranga olivacea), le rouge et le noir. 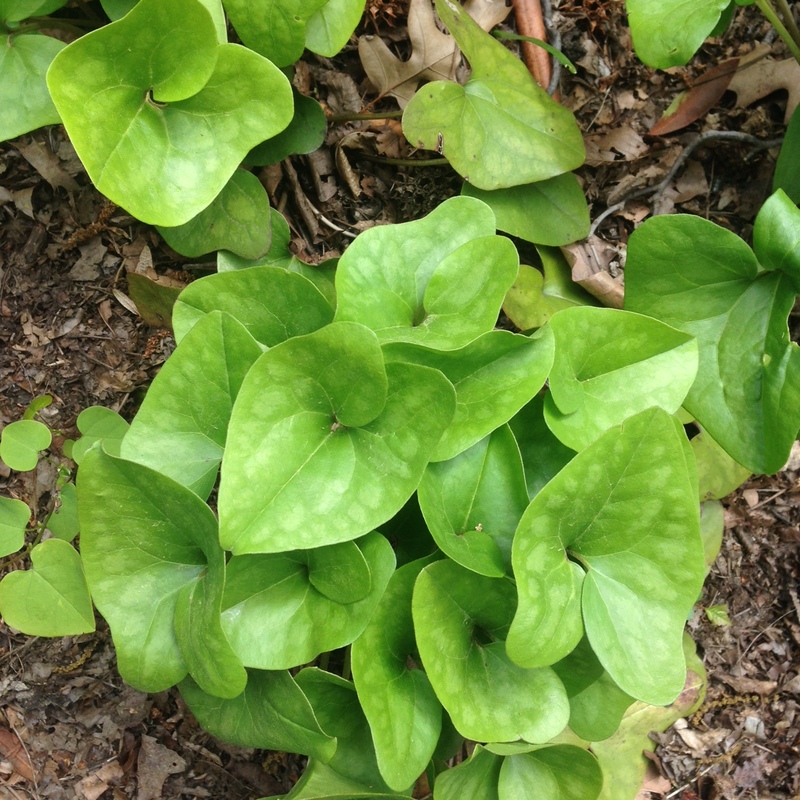 Arrowleaf or heartleaf ginger, also known as little brown jug (Hexastylis arifolia). You can see the arrow and heart inspiration, but what’s with the jugs? 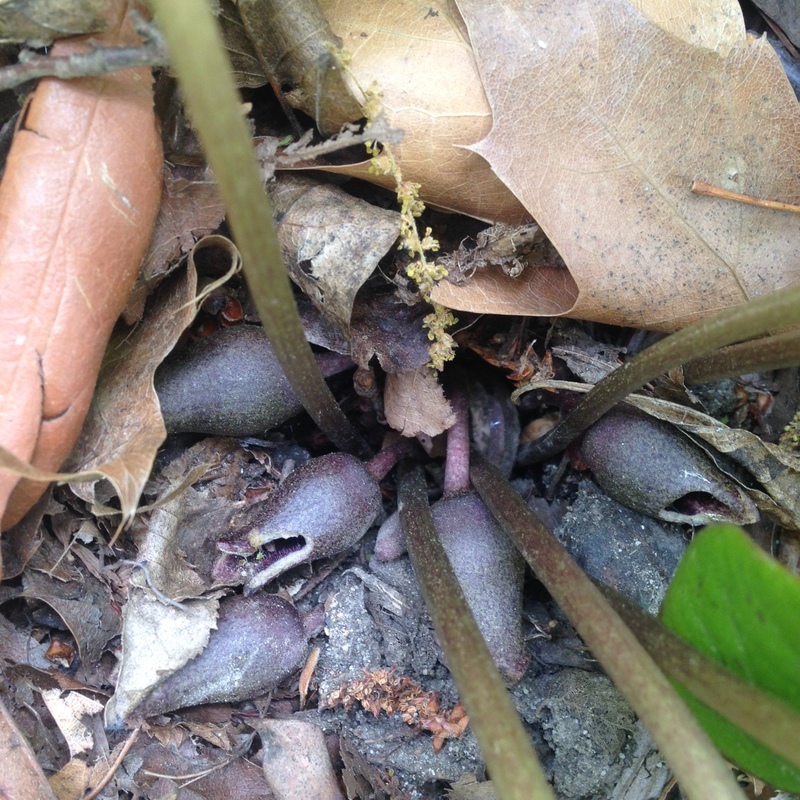 As in wild ginger (Asarum canadense), a related plant, the action is at ground-level. The little brown jugs (LBJs?) 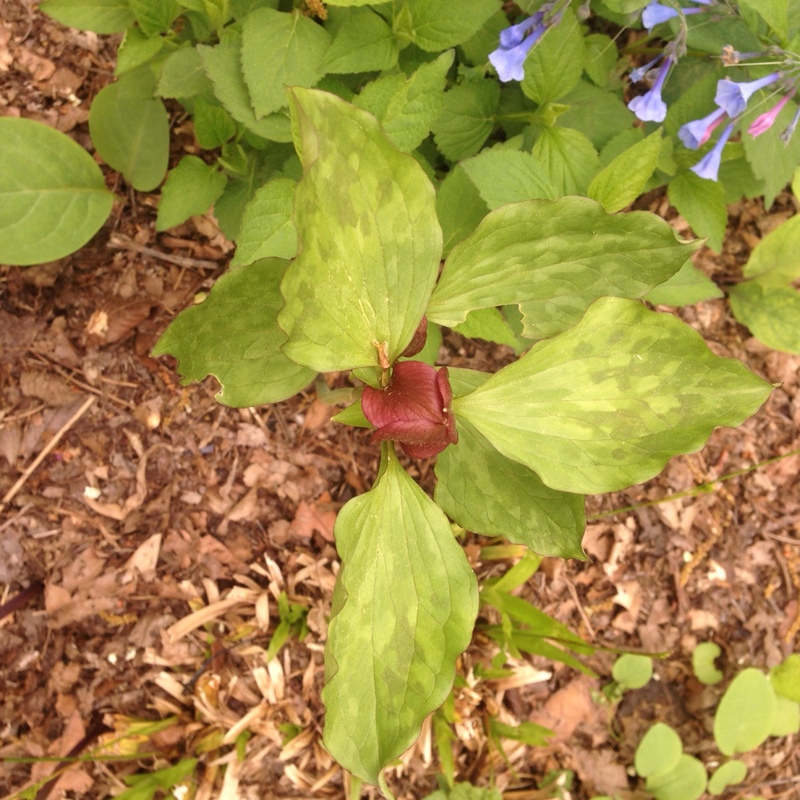 are flowers that start out green and age brown. 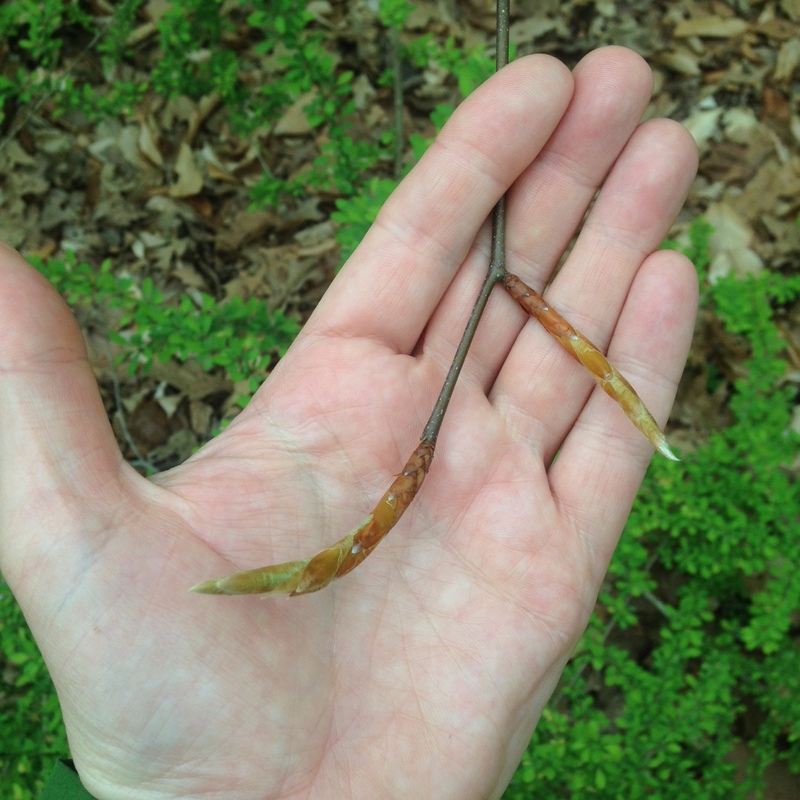 While these particular specimens were found in the native plant section of the NYBG, they are more specifically native to the SE, getting as north as Virginia and as west as Kentucky. Ants evidently disperse the seeds. 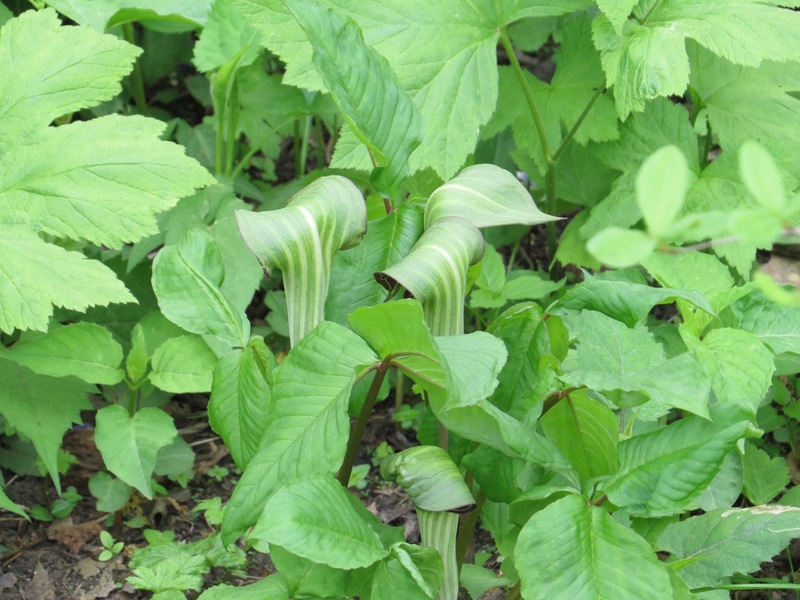 Someone hath browsed off the overhanging spathes and tips of the spadicies of these Jack-in-the-pulpits (Arisaema triphyllum). 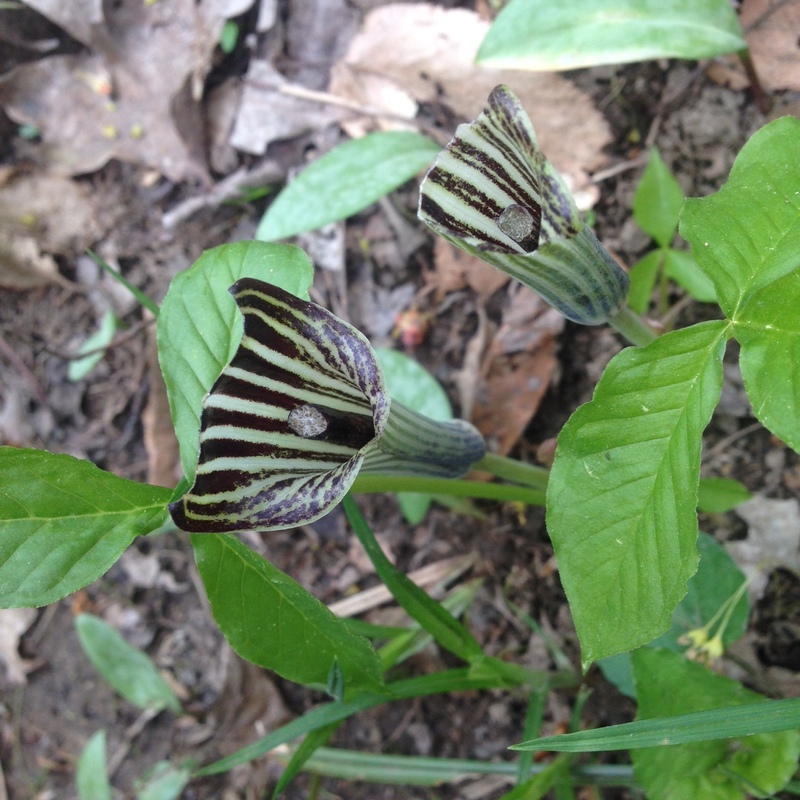 This gives us a good view of the pin-striped goodness within these curious flowers. Otherwise you have to get personal. 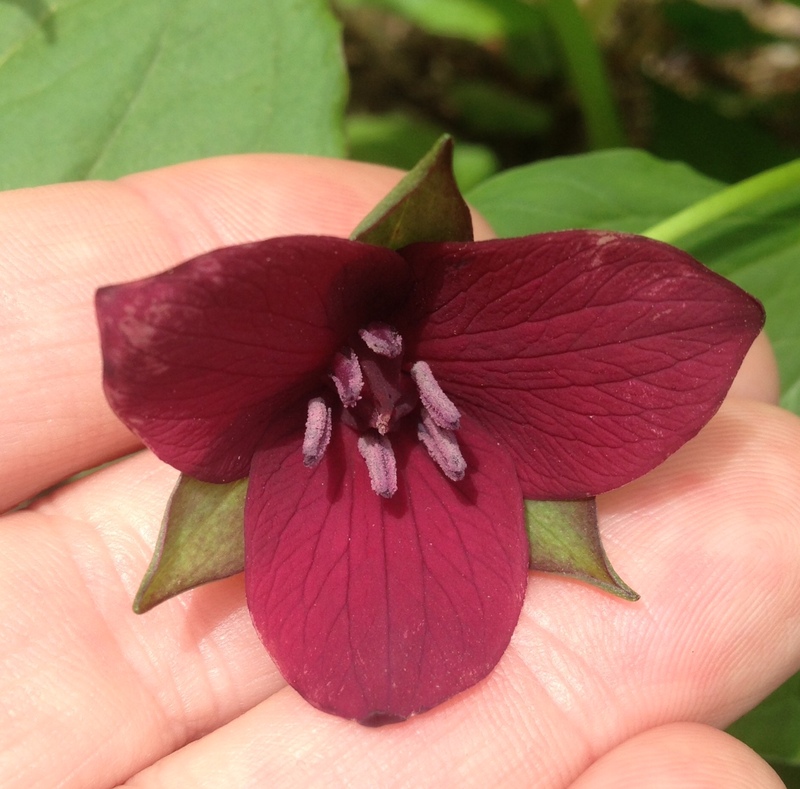 This is a flower that hides itself. Who is this Jack, you might well ask, and what is he doing in the pulpit? 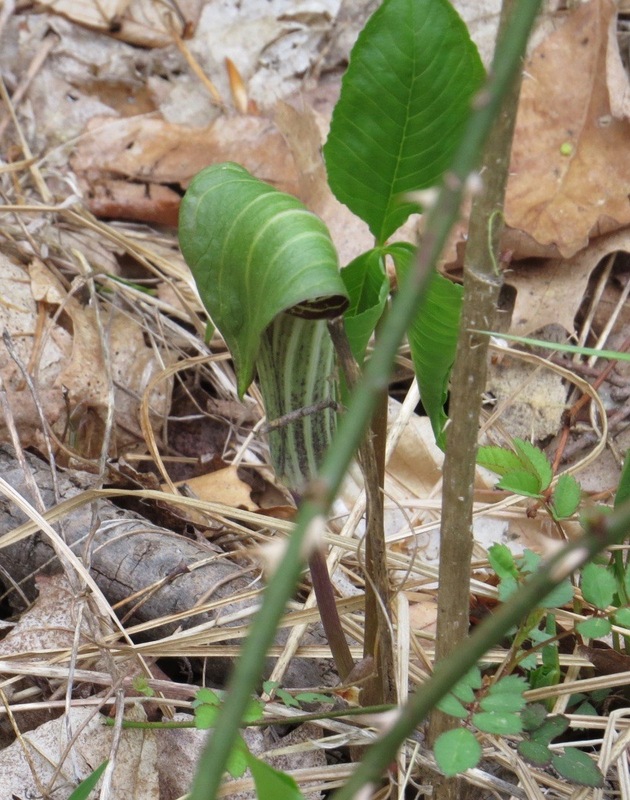 To say the spadix “looks like a man,” as does Better Homes & Gardens, seems quite the euphemism. The part is not the whole. 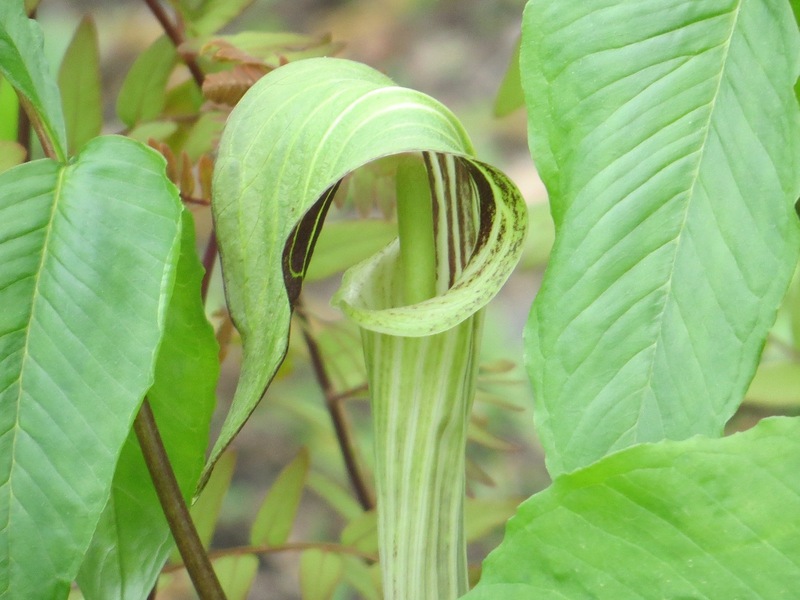 According to this site, the plant is pollinated by fungus gnats and thrips. 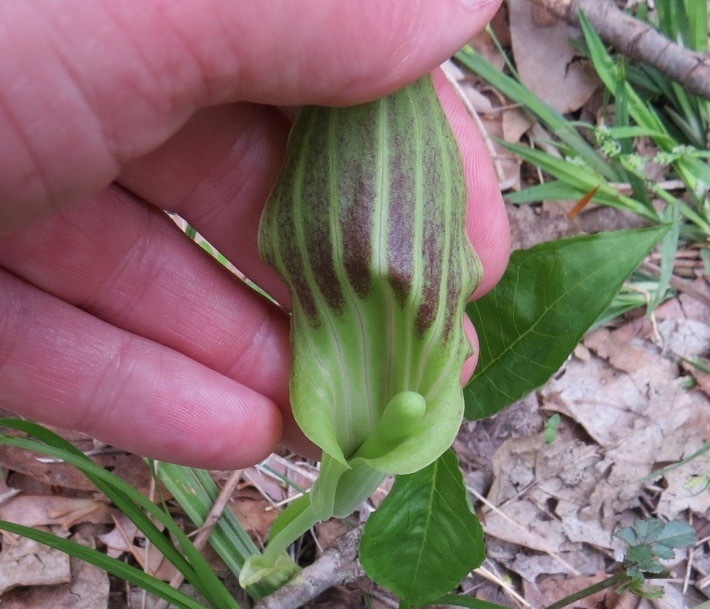 Also of note on that page: the ill-tasting plant scares off herbivores, so who did the work seen up top? Two legged? Deer not yet in the know? 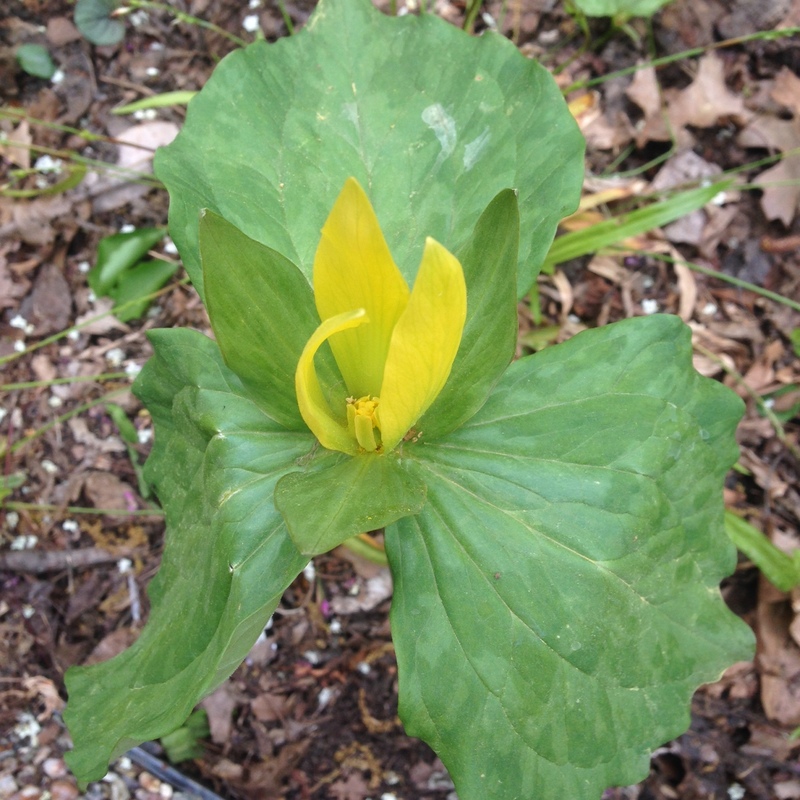 Oh, spring, spring, you are so fast! 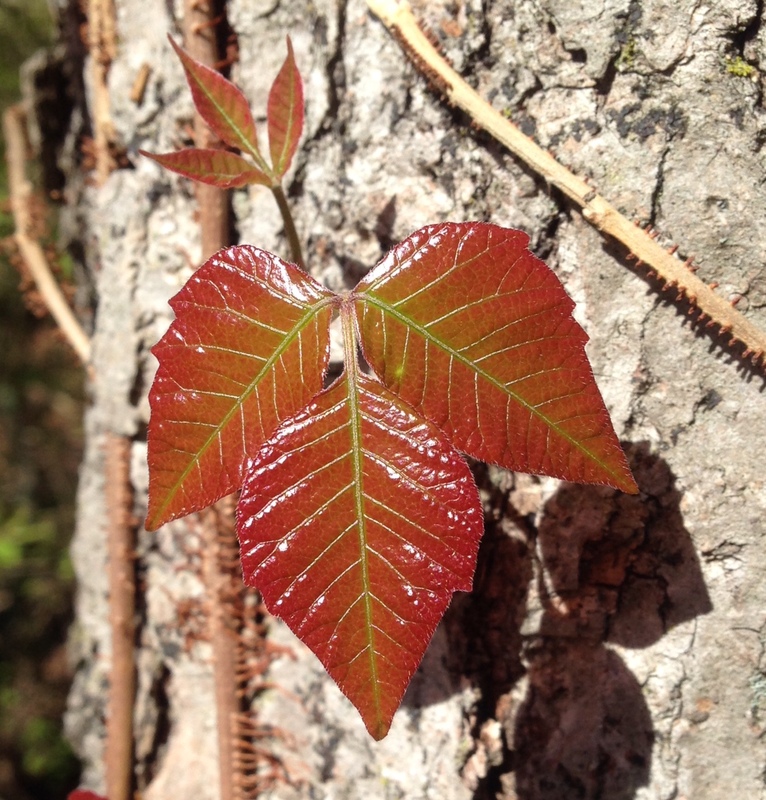 Poison ivy (Toxicodendron radicans). One of the lindens (Tilia). 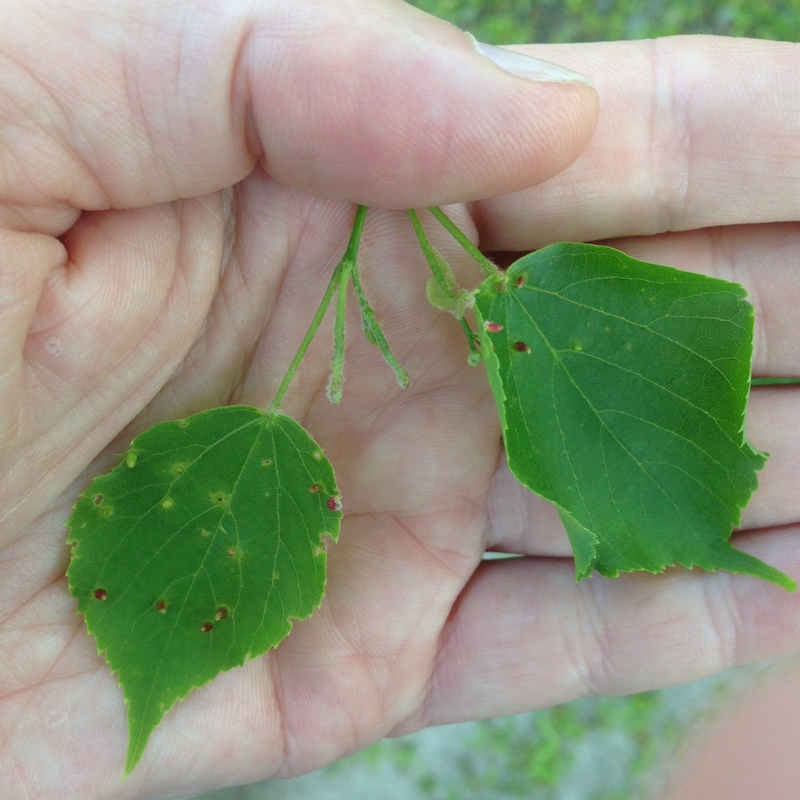 Some galls are already planted on these. As with the leaves immediately below, these were windfalls. 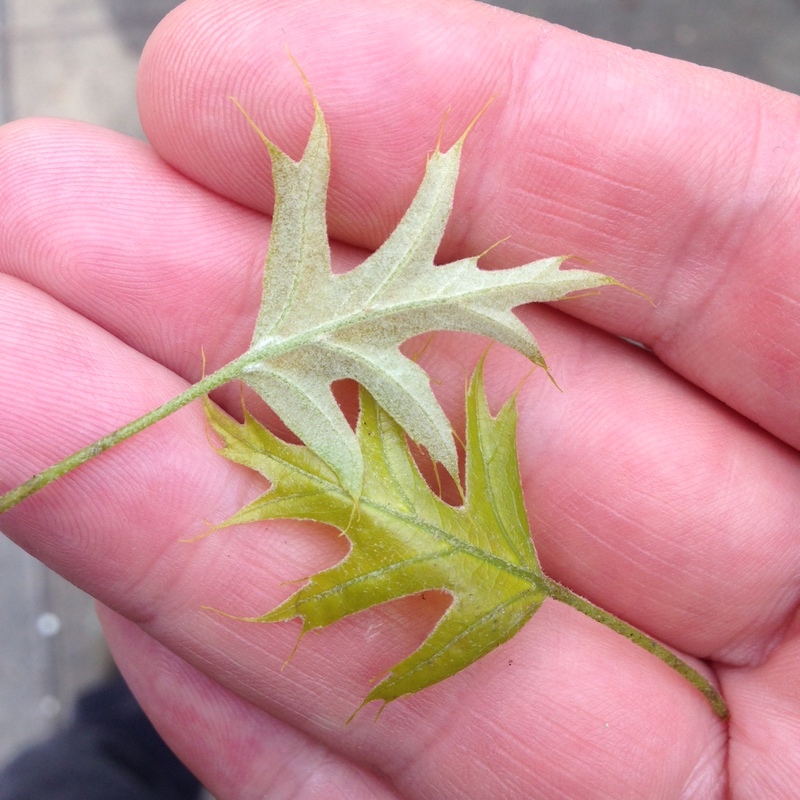 Pin oak (Quercus palustris). Beech (Fagus) about to blow. 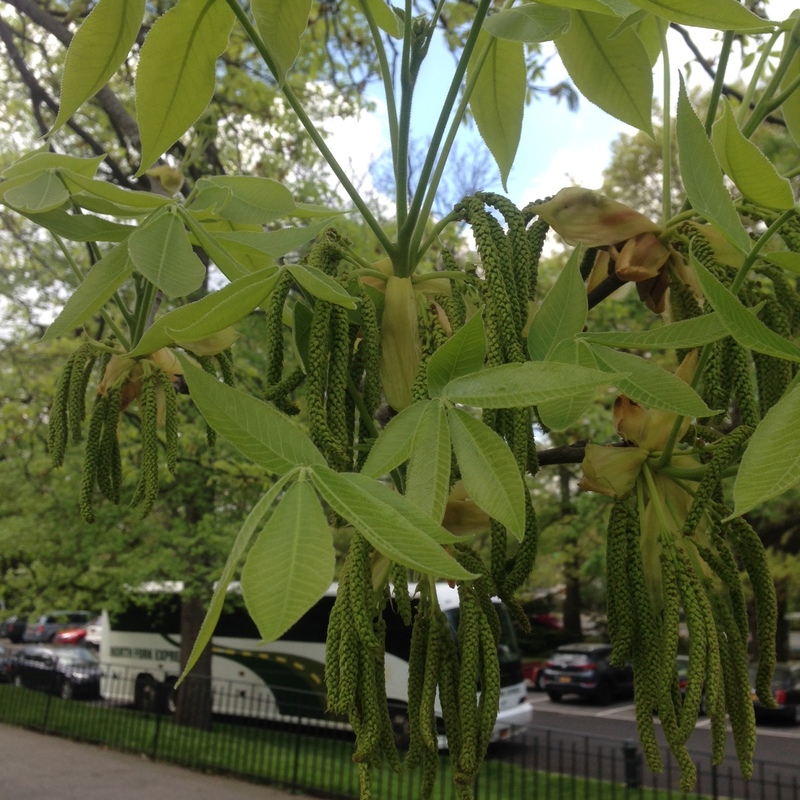 Mockernut hickory (Carya tomentosa) already blown. Share the pre-existing condition of being human? Then the GOP WealthCare abomination that passed the House yesterday isn’t for you.